Donations made to a food bank are shown in this file photo. Loblaw Companies and George Weston Ltd. will receive immunity from Canada's competition watchdog for their part in the price-fixing arrangement, after admitting to the scheme. As a goodwill gesture, they’re offering gift cards to any customer who bought packaged bread products at any of their stores before March 1, 2015. But some customers say they would rather have that money donated to a local food bank or to someone else in need. Take your Loblaws card and shove it. Into the hands of someone that needs it. Everyone go here. https://t.co/ACNqhqky1i Register to get your card and then donate it. Many are pointing out that $25 is not that much money for many Canadians. But given that Loblaw expects 3 to 6 million customers to receive the cards, that could potentially add up to a whopping $75 million to $150 million for those in need. Loblaw spokesperson, Kevin Groh, told CTVNews.ca in an email that Loblaw thinks donating gift card to food banks is “a lovely idea, as we’re already a leading contributor to food charities nationwide. With the card in hand, customers could easily buy food for themselves or for a food bank,” he said. Michael Maidment, the executive director of the Ottawa Food Bank, has noticed all the chatter about donating the gift cards to organizations like his. “I think it’s a great idea in these circumstances,” he told CTVNews.ca in a telephone interview. He said food banks like his can often make cash donations go further than donations of boxed or canned foods. Every dollar donated to a food bank is worth $5 in food, when you take into account food that is both bought and donated from wholesalers, he said. Food Banks Canada spokesperson Marzena Gersho says her organization is happy to hear that so many Canadians are considering donating gift cards to their local food bank. 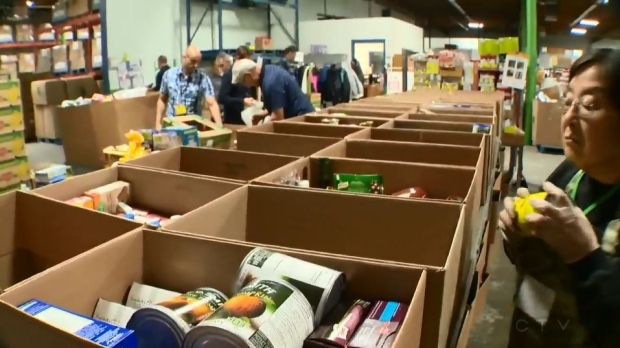 She says more than 800,000 individuals turn to a food bank for help every month and donations of both food and cash are needed all year long. Find your local food bank on the Food Banks Canada website.